Network Clipboard & Viewer allows to share Windows Clipboard content on networked computers (wired or wireless). Once the clipboard group/users access are configured, clipboard information copied on one computer can be immediately pasted on another computer in the network with just one click!. You will not be interrupted in your work, and your local clipboard will not be altered just because a remote user copy information to clipboard (like others programs do). Many clipboard formats are supported including application specific formats. Files and directories can also be copied and pasted transparently from one computer to another. You just have to define the computers on your network you want to grant access to your clipboard. You may keep Network Clipboard & Viewer running in background. 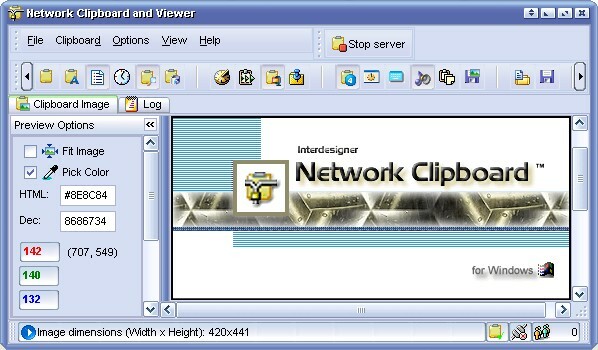 Right-click Network Clipboard & Viewer's icon on System Tray. Click icon on System Tray to show/hide main window. You can define allowed and blocked computers on your network, users allowed / denied to connect to your Network Clipboard & Viewer, and even password protect from remote access. Favorite computers (computers you'll work most) are easy to setup and are always just one click away. How to configure TCP/IP Protocol, Windows Firewall.